The HDS 801 B is a mobile hot water high-pressure cleaner built on a corrosion resistant tubular steel frame offering all-round protection for components. Ideal for cleaning applications where there is no power supply available. 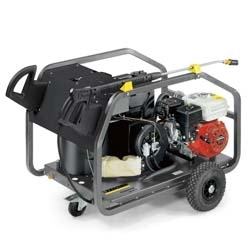 Built with an air cooled four stroke 5.5 HP Honda petrol engine, a pull starter and in-built generator, the HDS 801 B is ideal for plant hire and construction companies, agriculture and local councils.